Engagement Ring Details: This is for the Solitaire Only. Made-to-Order Custom Twig Wedding Ring using Three Black Polished Diamonds set in 14k or 18k Gold. Hand sculpted Twig Engagement Ring, hand sculpted, a one-of-a-kind 3 stone engagement ring or 3 stone mothers ring. 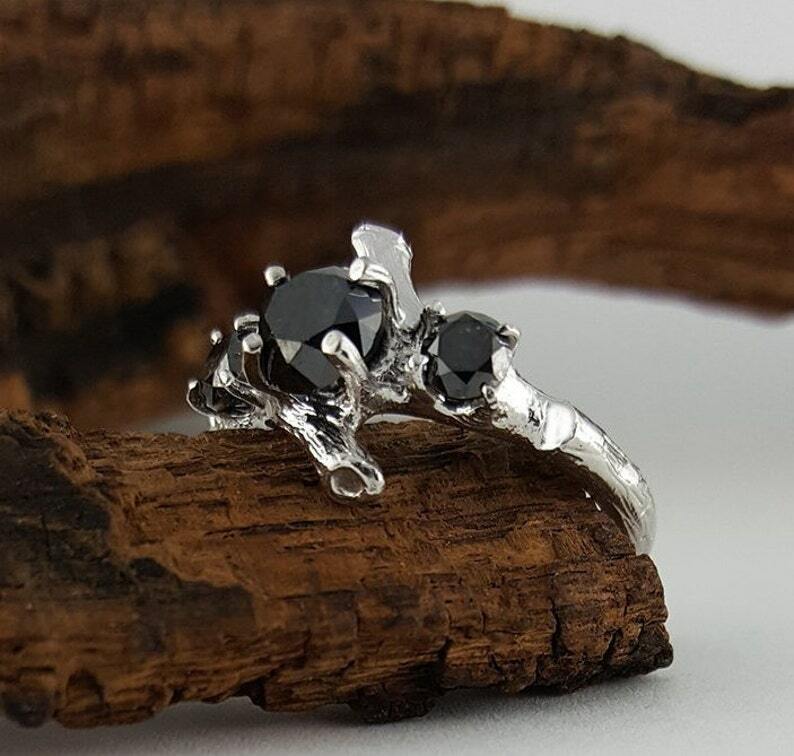 I wanted to create a beautiful yet elegant 3 Diamond Twig Bridal Set using natural black diamonds, so I sculpted the center branch to focus on the diamond and then added two smaller diamonds on each side. ● Diamonds: 1 carat natural black diamond at approx. 5.5mm across. ● Diamonds: 2- .25 approx. carat natural black diamond at approx. 3.5mm across. ● Cruelty Free Diamond - All our diamonds comply with UN Kimberley regulations. ● Leaf Engagement ring is approximately 11mm wide at top and 1.9mm at the bottom. Note: Matching Twig is available. ● Your rings will come a black velvet ring box.